The Audi R8 Spyder is a canvas-roofed convertible that has it all – great looks, brilliant specifications and most importantly, that normally aspirated 4.2-liter V10 with 540 hp available – all there to make drive time ridiculous fun. Mated to the 7-speed S-tronic automatic dual clutch transmission and the Quattro all-wheel drive system you’re looking at an amazing supercar that hits 60 mph in a fraction over 3-seconds with a top speed just under 200 mph, and it has all the right spec in all the right places to make the base price of $177,100 look rather attractive to those that have it. When you climb the Audi model ladder, the one sitting right at the top is the R8, the brand’s supercar for the people. There are two levels of R8 up there though, the regular version and the Plus version. As the name suggests, Plus is the one with more power at 610 hp with the regular version being rated only a little less at 540 hp. Just to make the R8 that little bit more desirable, Audi have been kind enough to remove the roof and add in the word Spyder to the name. Right now an Audi R8 Spyder can be had within normal V10 spec with the Spyder Plus being added to the lineup sometime in 2018, and after being previewed at the Monterey Car Week, it looks set to be a popular option. The Audi R8 Spyder is clearly a racecar for the street, immediately evident by the two race seats up front - fully adjustable ones of course – and a chunky, flat-bottomed multifunction steering wheel. The seating position is like a fighter jet with everything sort of wrapping around the driver so that it’s within easy reach of the driver, the only person this car is created for. In many cars the passengers can stay entertained by looking at or fiddling with the infotainment system, but there isn’t one in here. Where you’d usually find it there’s small round screens and buttons for the climate control and instead all functions that would have been found there are now in the 12.3-inch screen that doubles as the instrument cluster. There are only a few spaces for storage in the cabin, and the trunk in the nose of the car is only going to fit the most necessary of items – like a change of socks and underwear for a week. 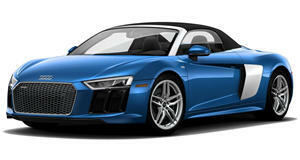 The main point of the Audi R8 Spyder form is to provide the ultimate driving experience. 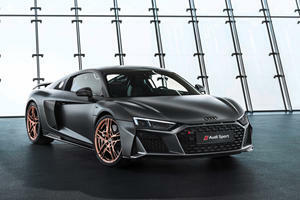 Audi have made sure that the convertible version of the supercar is every bit as good as the coupe version. Things are usually a bit heavier when the roof comes off thanks to stiffening the chassis to replace the rigidity lost from the roof removal, but Audi have sorted this out, evident from the matching performance figures. With the magnetic ride suspension in play there’s no real discernable difference in the way the car handles, it’s still got minimal body roll and even the slightest steering inputs see the car react. The different drive modes are easily selected via Audi Drive Select and they allow optimized settings to suit different situations like Comfort, Individual, Dynamic and Auto. Handling is great; the Quattro all-wheel drive system with rear bias offers maximum traction and the 7-speed automatic S-tronic transmission is fast and precise to allow proper exploitation of the whole package. 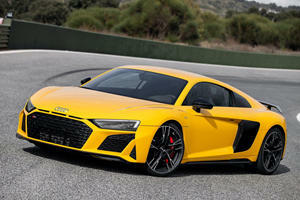 With a normally aspirated V10 in play you know some serious performance is on the cards. The Audi R8 Spyder sees fitment of the 5.2-liter V10 that’s been rated to produce a healthy 540 hp with 398 lb-ft of torque. When flying through the gears on that slick and fast 7-speed automatic transmission the performance is nothing short of awesome, Audi claims the R8 Spyder it can launch from standstill to the magical 60 mph mark in as little as 3.5-seconds, and when you stretch it’s legs on the highway the convertible supercar is able to reach a maximum of 198 mph. The Audi R8 is the best of the best, and every part of it confirms this. On the safety side of things there are systems like electronic stability control, traction control, ABS braking, electronic brake-force distribution and airbags in the usual locations. There’s also pop-up protection in the form of bars that explode upwards to protect occupants in the unlikely event of a rollover accident. 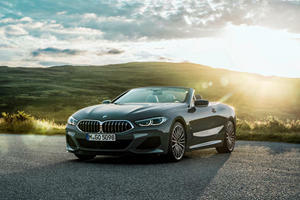 There’s an optional 550-watt Bang & Olufsen sound system for the cabin and this, along with the MMI navigation and every other electronic function is accessible via the virtual cockpit that’s also the instrument cluster – a 12.3-inch digital display. As for the finishings, there’s a host of leathers available to customize things as well as brushed aluminum and carbon fiber. When it comes to fast soft tops, there are a few around, but not may can reach almost 200 mph. The Audi R8 Spyder is the convertible supercar for the masses, and while it’s not cheap, it really is one of the best options for buyers in this class. It’s like that popular kid in school that has the looks, the moves, the power and the great genes, there’s not really any way to fault the car. The 540 hp normally aspirated V10 is not only responsible for blistering performance, it has the soundtrack to match. The V10 Plus will be here with even more on offer, but all the extra power will do doubt come at a price. But it doesn't actually have any more power. A new type of halo car is coming instead. You can spend way less than $121,000 on a luxury convertible.